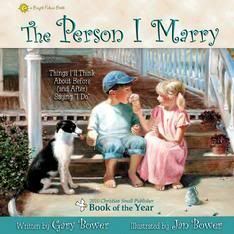 The Person I Marry is a very sweet book written by Gary and Jan Bower. The Bowers are the parents of 12 children, and authors of several children's books. The Person I Marry is part of the Bright Futures Collection, which includes several other titles. This particular book is a celebration of marriage, and all those wonderful qualities the person you marry should have. here are some things that I need to consider." The story emphasizes love, commitment, and purity - among other Godly virtues. Children of all ages, as well as adults are the audience for this book. I felt a special connection to my husband as I read the book aloud because our marriage (by the grace of God) embodies so many of the qualities in the book. You can watch this video about the book. As you can see, the drawings are stunning, and the rhyming text makes it such a sweet read. The Bowers truly are blessing their readers through their ministry of writing books. I must admit, reviewing this book was difficult. We received it in an electronic format and were instructed to read it on our computer. For my children and I, a large part of the reading experience is snuggling on the sofa together to share a great book. I tried to load the book on my iPad and the experience was less than optimal. Reading the book by the computer wasn't that great, either. I'm sure the hardcover book is wonderful (the story and pictures looked superb), but it just didn't translate in an electronic format. My ten year old daughter thought it was a good book (but again, her attention span for it wasn't long because of the format). My six year old son didn't stick around for the reading. I think my husband and I were the most impressed because we looked beyond the format and saw the gravity of the words. The Person I Marry must be good because it won the 2010 Book of the Year from the Small Christian Publishers Association. You can purchase the book through Bower Books for $11.99. I would see this as a wonderful gift to give to grandchildren, Godchildren, or just a book to purchase and have in your library. If you ask at checkout to have the book autographed, that's free! I thought that was pretty neat. To read what my crew mates are saying about this book you can visit the crew blog. Disclaimer: I received the above named product from TOS Crew in return for my honest review. I have not been compensated in any other form.